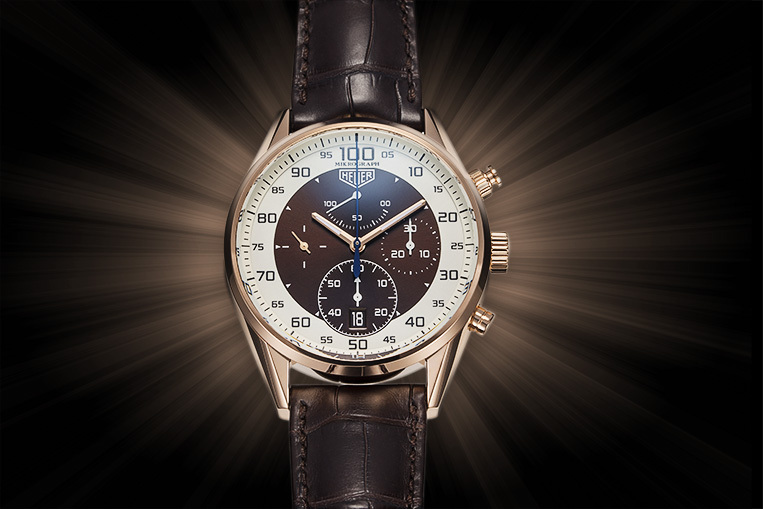 Review: TAG Heuer Carrera Mikrograph | Watchfinder & Co.
One hertz. That’s your average quartz watch, ticking away once per second. Tick, tick, tick. A vintage mechanical watch at 18,000vph ticks at two-and-a-half hertz. The modern equivalent beats at 28,800 times per minute, that’s four hertz. Zenith’s superb El Primero, a hi-beat movement at 36,000vph—five hertz for that one. This TAG Heuer Carrera Mikrograph? Fifty hertz. That’s one hundred beats every second. 360,000 per hour. Phew! Performing this high-speed wizardry is no mean feat, and is achieved by separating the chronograph mechanism from the timekeeping mechanism entirely. Usually, the chronograph sources its drive and regulation from the mainspring and escapement, but the torque required to achieve a fifty hertz beat is just too much for a standard movement. 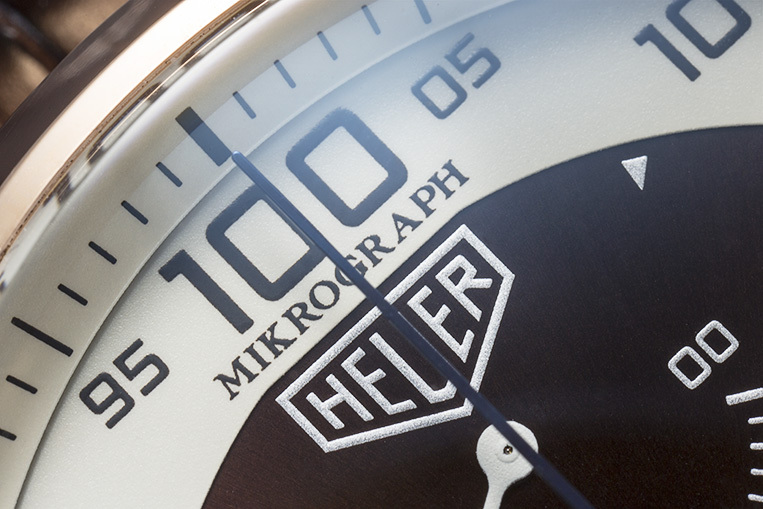 So the Mikrograph chronograph gets its own drive, which must be hand-wound independently of the auto weight. A retrograde power reserve indicator reads the remaining time left in the chronograph’s mainspring—ninety minutes is all you get, although the indicator confusingly reads as a percentage. Chronograph wound, power reserve full; this is where the magic happens. The chronograph functions as expected (no additional trickery like flyback or split-seconds here), and a push of the start button sends the central seconds hand all the way around the dial in a single blistering second. It’s a most bizarre sight, this blue seconds hands speeding in dizzy circles like there’s no tomorrow—it’s almost disorientating. A second push and the hand stops dead, no quiver or hesitation, as though it had never been moving at all. Is there a point to this craziness? Well, take any explanation with a pinch of salt; after all, we’re unlikely to see mechanical timekeeping making a reappearance at the Olympic games any time soon. But you’re not reading this because of necessity, you’re reading this because of curiosity, and that’s what the Mikrograph is—a curiosity. That TAG Heuer even considered making this, let alone actually went through with building it, is a positive sign that watchmaking as we know it is blossoming. Get this: a simple, time-only movement, built from scratch, costs £1 million to develop. The Mikrograph? I dread to think. The basic movement here may borrow its timekeeping innards from the calibre 360, but the chronograph itself is all new. Not just new design, but new territory completely, and that of course makes it expensive. 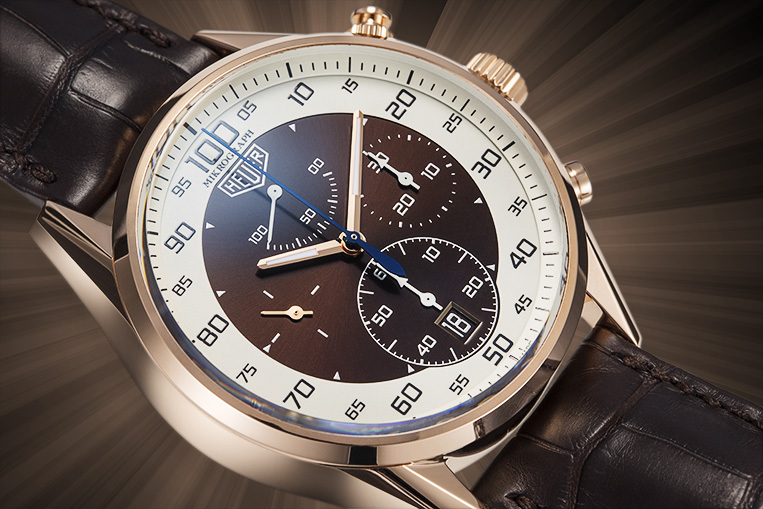 £41,500 for a TAG Heuer (badged simply ‘Heuer’ because . . . well, we’re not really sure) is a big ask, but let’s face it, when it comes to competition, there just isn’t any. Perhaps another watchmaker will step up to the plate and match or even surpass TAG Heuer’s 360,000vph monster—but even if they do, they’ve already lost. Why? 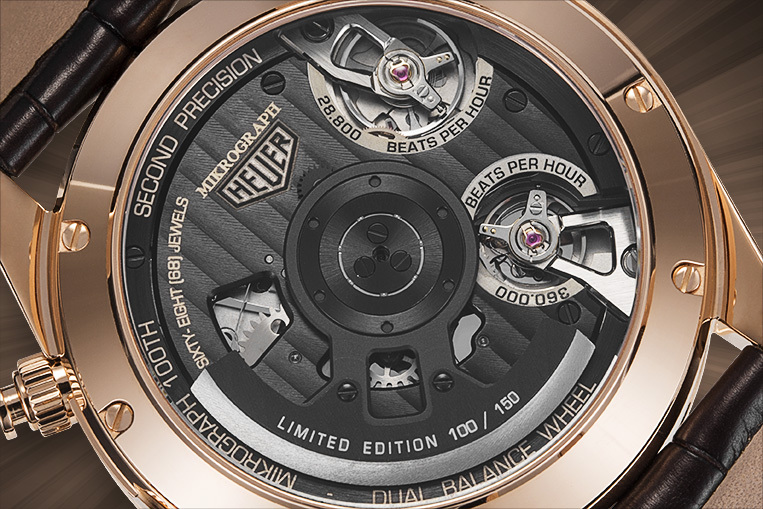 Because TAG Heuer also has the even more expensive Mikrogirder, and that has a balance that oscillates at a scarcely believable 3,600,000vph. Physics? What physics?